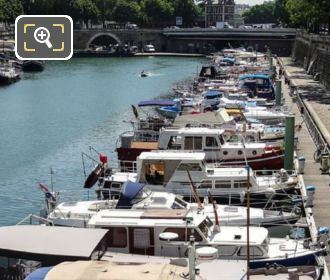 This time we were in the 4th and 12th Arrondissements of Paris when we took these high definition photographs of the leisure marina called Port de l'Arsenal, which was completely revamped in the 1980s on Canal Saint-Martin and is now home to public gardens, restaurants, pleasure boat cruise companies, private house boats and much more. 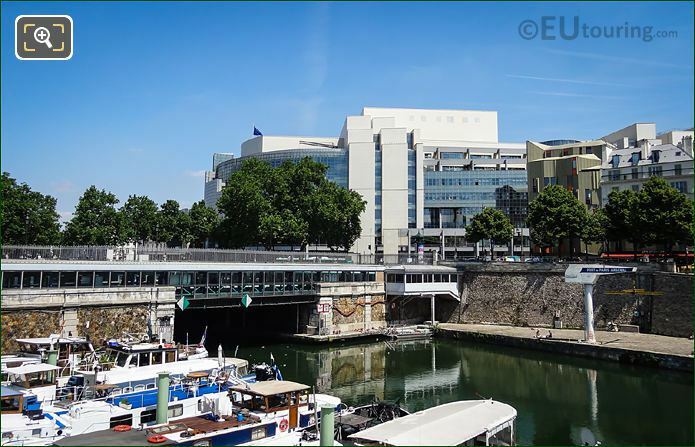 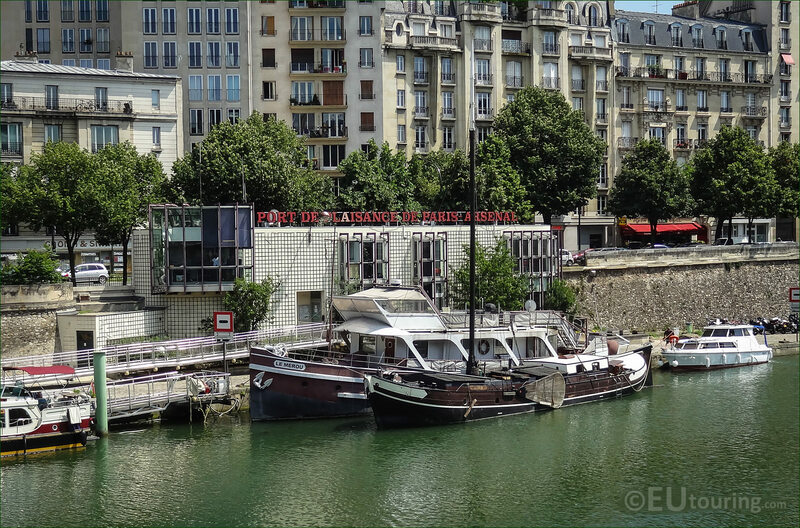 Here you can see the harbour offices for the Port de Plaisance de Paris Arsenal leisure port, which is home to the port authority for moorings, security, stopovers, maintenance, etc and in front of the building in this image you can see the boat called Le Merou moored up. 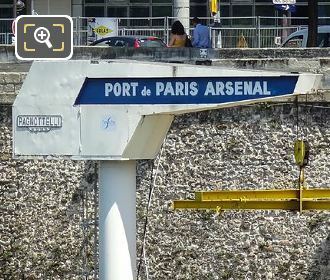 Here you can see a photo we took of a boat crane that shows the name Port de Paris Arsenal, which is exactly where were when we took this picture, however, you will find that the port is normally referred to as the Port de l'Arsenal and sometimes the Port de Plaisance Arsenal, as it became a pleasure boat marina in the 1980s. 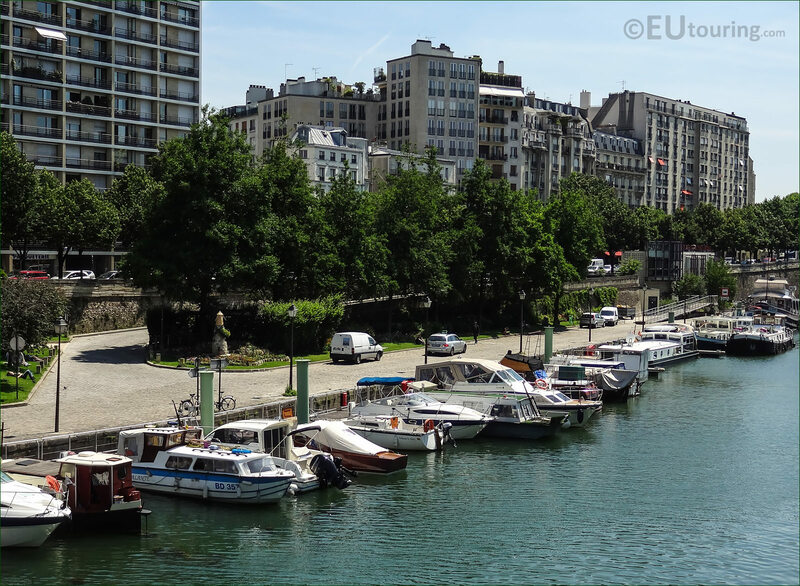 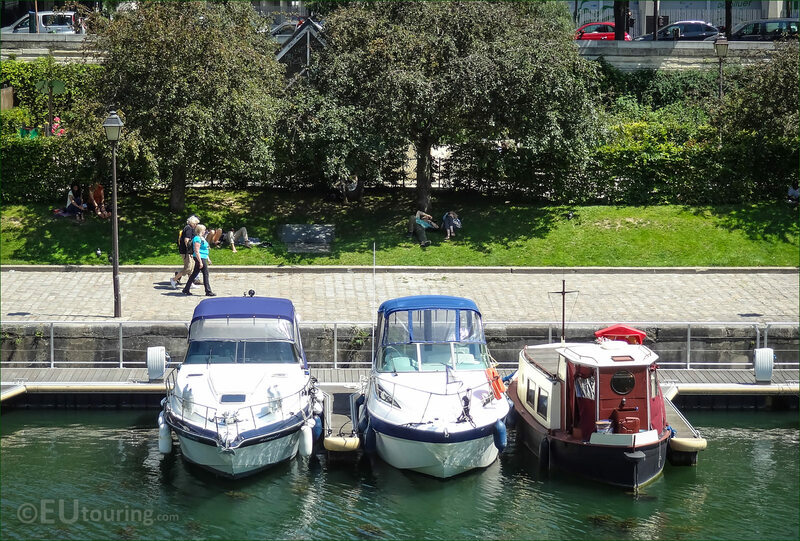 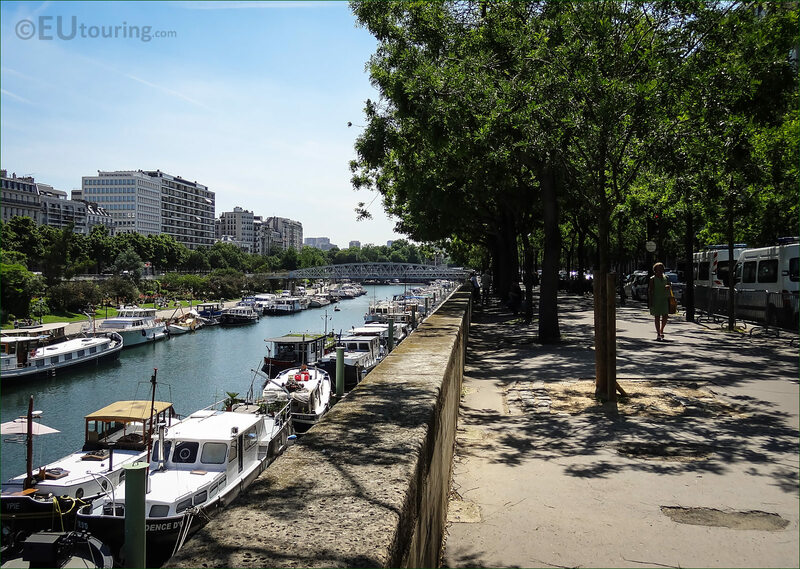 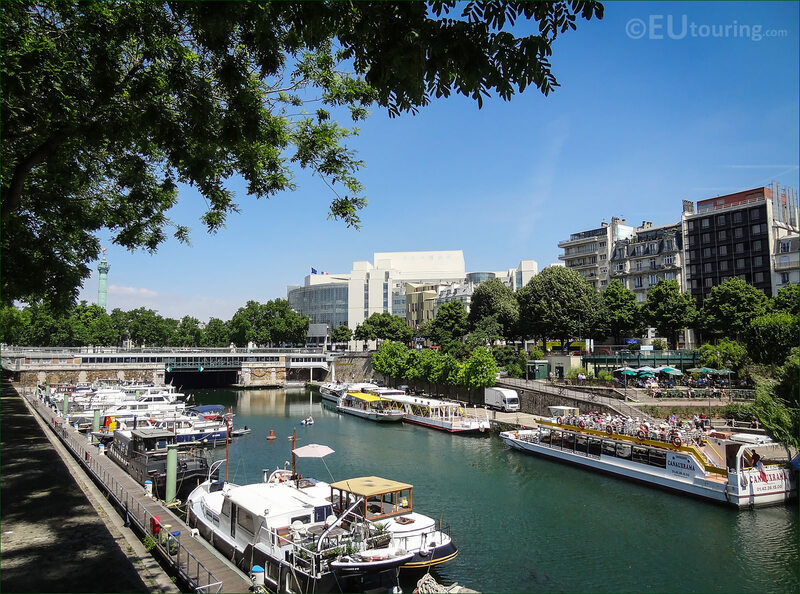 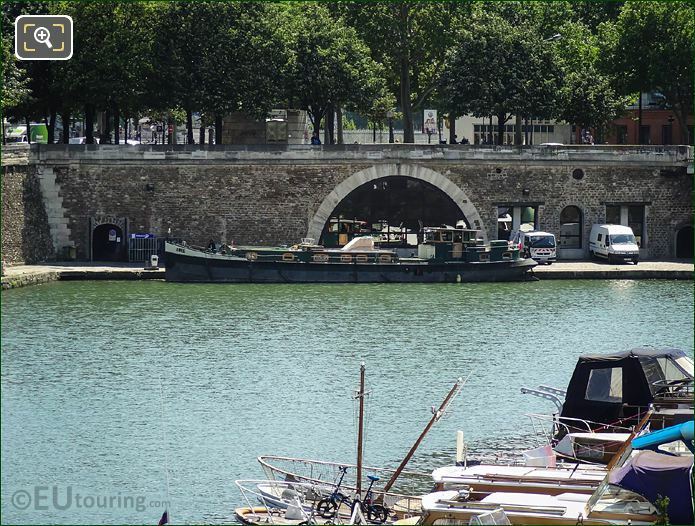 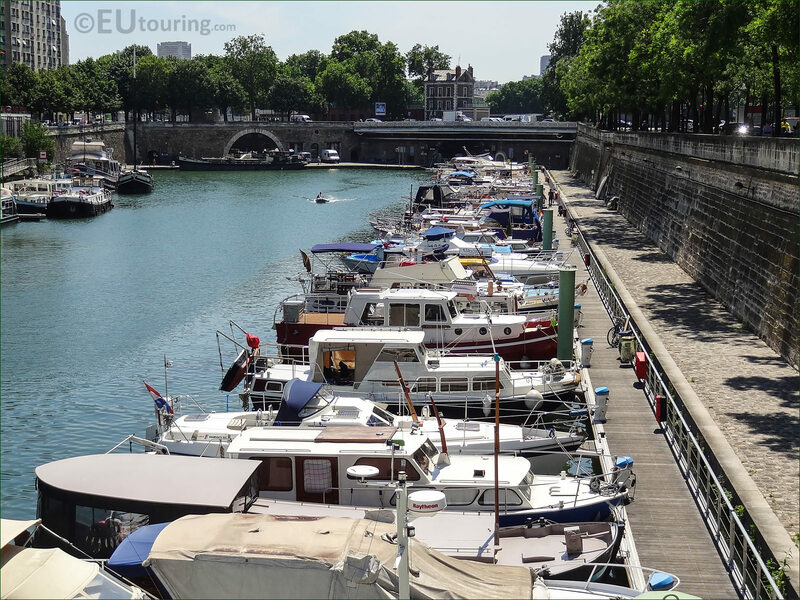 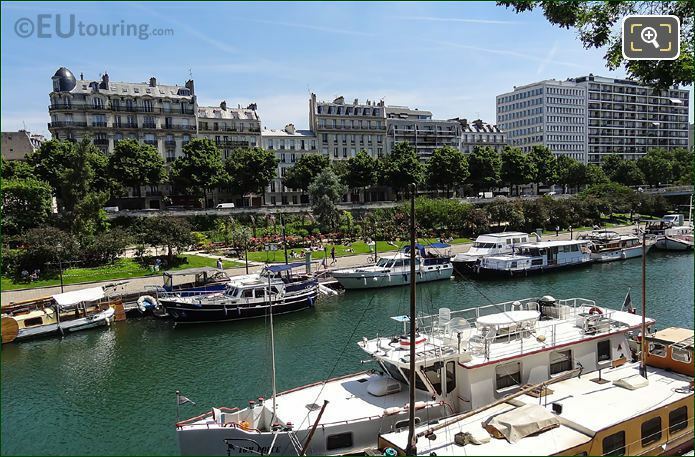 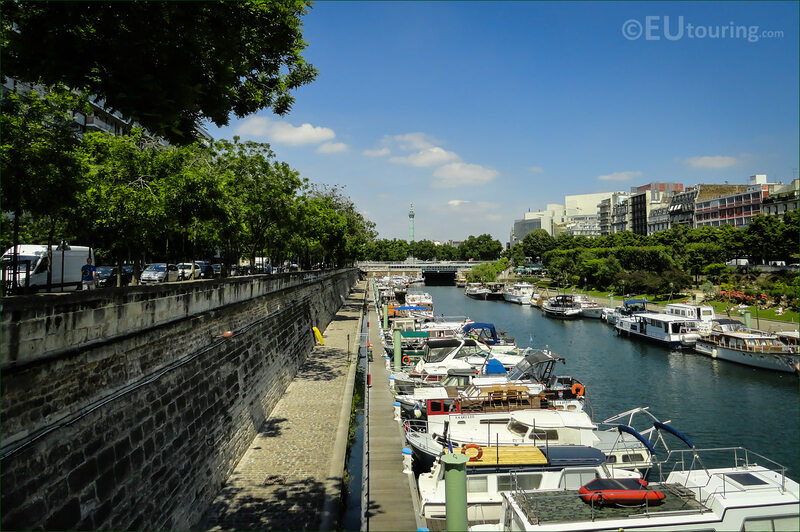 From small two and four birth boats like you can see in this photograph, through to larger pleasure cruisers, the Port de l'Arsenal, also known as the Bassin de l'Arsenal, is now a pleasure boat marina that can hold over 200 vessels for river and canal navigation in Paris. As you can see from this photo, the Port de l'Arsenal is now a leisure marina in Paris that has kept its name from its origins when it used to be a part of the arsenel and the fosse for the Bastille fortress and prison that was destroyed during the French Revolution. 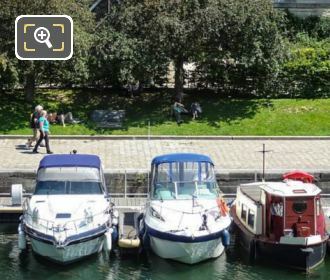 This is a photo we took looking at three of the boats moored up at the Port de l'Arsenal looking towards the Jardin du Port de l'Arsenal where people were relaxing on the grass in the shade of the trees away from the hustle and bustle, but as you can also see in this image, there is a lovely promenade for taking a stroll, cycling or even roller blading. Here you can see a photo we took of the Passerelle Mornay footbridge that goes over the the Port de l'Arsenal in Paris, which was originally constructed back in the late 1800s as a commercial port for the city, until it was converted into the leisure marina you can see today. We took this photo showing one of the houseboats called the Ibis, which was moored up in the Port de l'Arsenal, or the Bassin de l'Arsenal as it is sometimes known, and this is the main starting point for cruises along the Canal Saint-Martin that first started to be constructed during the reign of Napoleon Bonaparte. 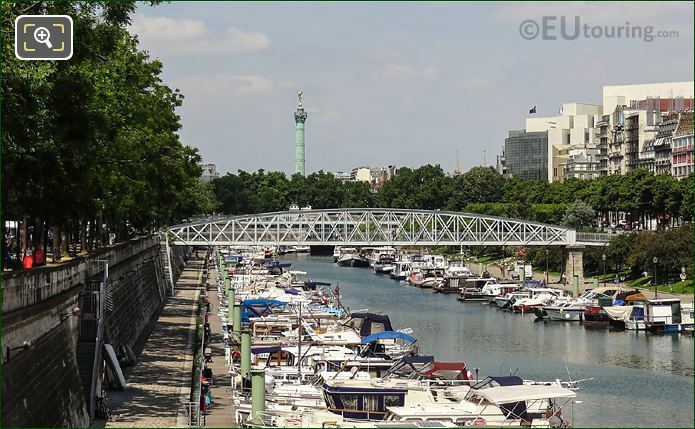 This is a photo we took of the Port de l'Arsenal looking towards Colonne de Juillet monument rising high up into the sky, and this leisure marina divides up certain areas of Paris, as to the left of the image you would be in the 4th Arrondissement, whereas to the right of the picture you would be in the 12th Arrondissement. 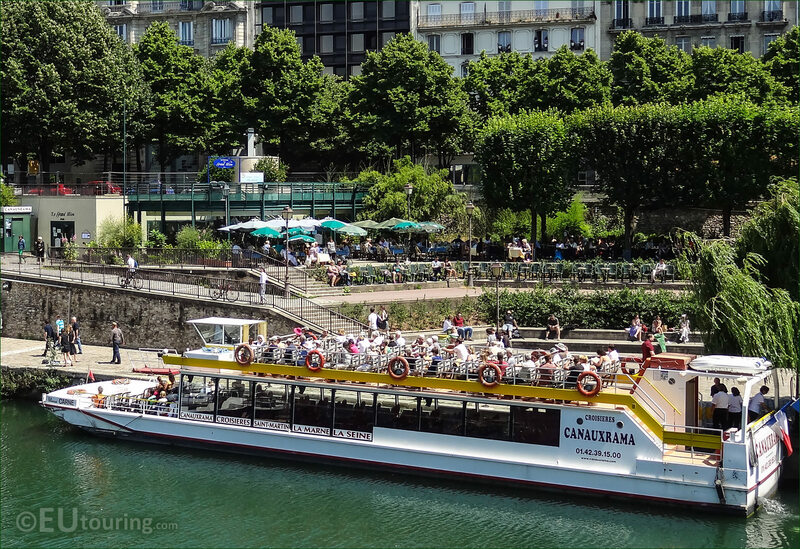 Canauxrama are one the companies that provide boat cruises in Paris on the River Seine and on the Paris Canals, and this is a photograph we took while at the Port de l'Arsenal, which is one of their main docks, and as you can see, it was getting ready to depart for a cruise on the Canal Saint-Martin up towards the Park de la Villette. 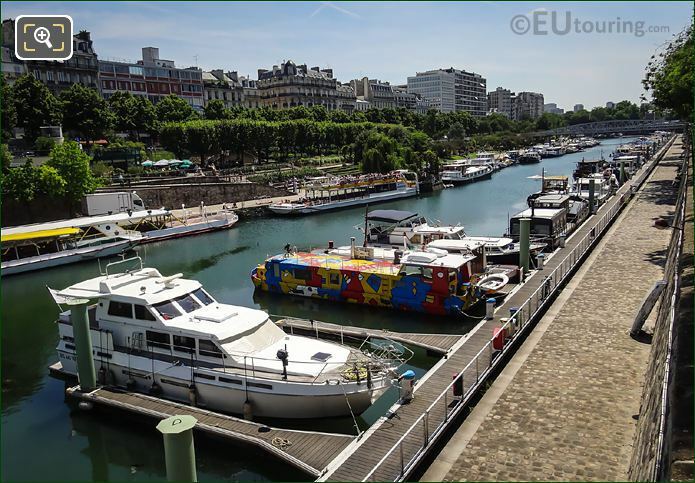 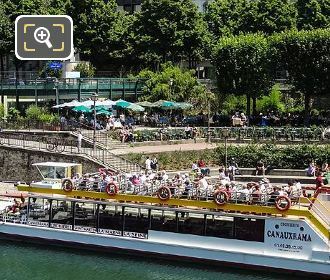 Whether it be a luxury motor cruiser, a brightly coloured canal boat or a barge for pleasure cruises on the Canal Saint-Martin, all of which you can see in this photograph, the Port de l'Arsenal has become a very popular leisure marina in Paris that can hold over 200 boats, although it was a commercial port until a few years ago. 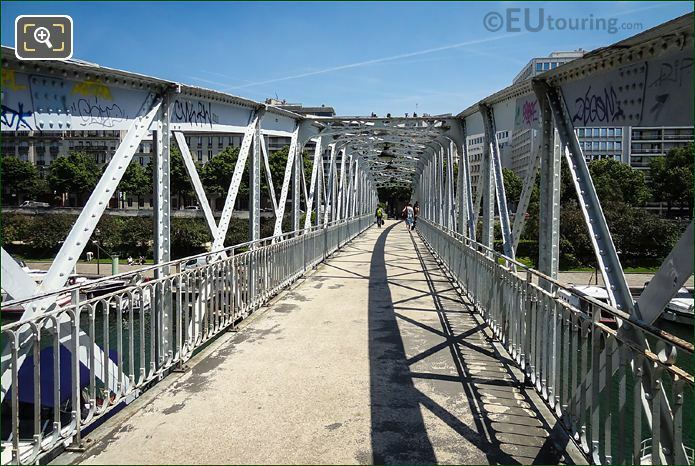 This steel footbridge we were standing on is called the Passerelle Mornay, and it was constructed to go over the Port de l'Arsenal, and called a truss bridge, it now goes over towards the Jardin du Port d'Arsenal that was created in 1983, which you can just make out with the trees on the bank of the Arsenal Port and leisure marina in Paris. 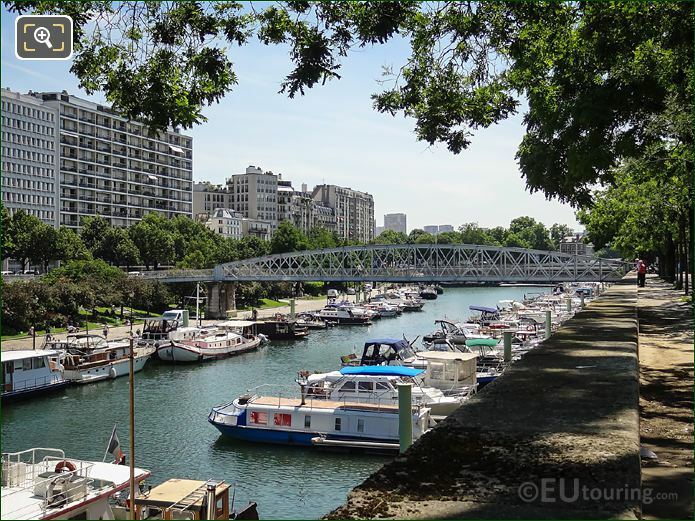 As we were standing on the Boulevard Bourdon, we took this photo of the Port de l'Arsenal looking down the marina towards the Passerelle Mornay footbridge, and as though you were heading towards the River Seine, with the Jardin du Port de l'Arsenal is to the left of the image. 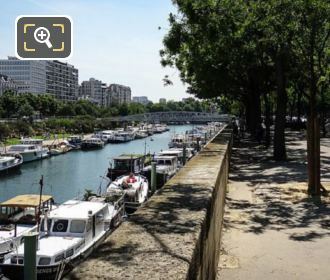 With the Place de la Bastille in the distance where you may just about be able to make out the July Column almost hidden by the trees, we took this photo of the Port de l'Arsenal, or Bassin de l'Arsenal as it is sometimes known, which was virtually derelict after commercial port operations ceased, that is, until it was totally revamped into a leisure port after the decision was made by the Mayor of Paris in 1983. 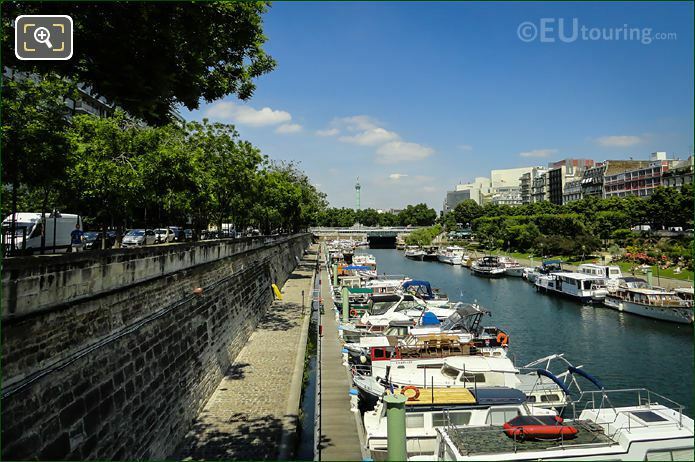 We took this photo showing the Port de l'Arsenal leisure port in Paris with a view of the last part of the Jardin du Port de l'Arsenal that has a small feature with a miniature windmill that you may be able to see in this image, and behind this is the Boulevard de la Bastille, which is a one way traffic road that takes you towards the Place de la Bastille. 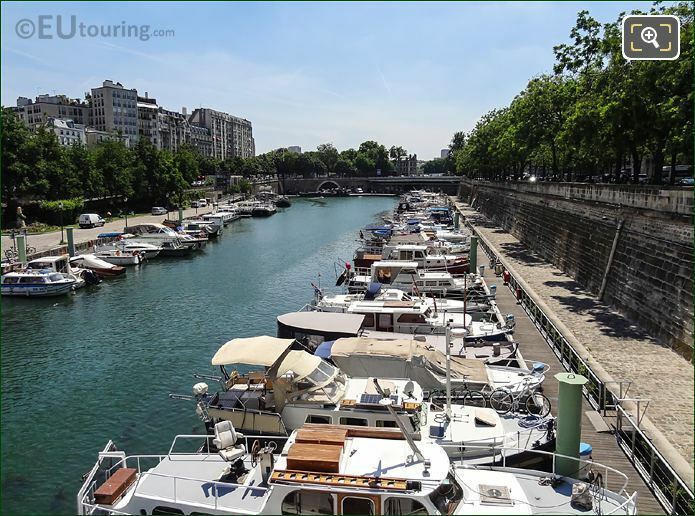 This is a photo we took while standing on the Boulevard Bourdon in the 4th Arrondissement while looking over towards the Jardin du Port de l'Arsenal in the 12th Arrondissement, and as you can tell from this picture, the Port de l'Arsenal with its lovely boats in the marina, actually defines and splits the two different areas. 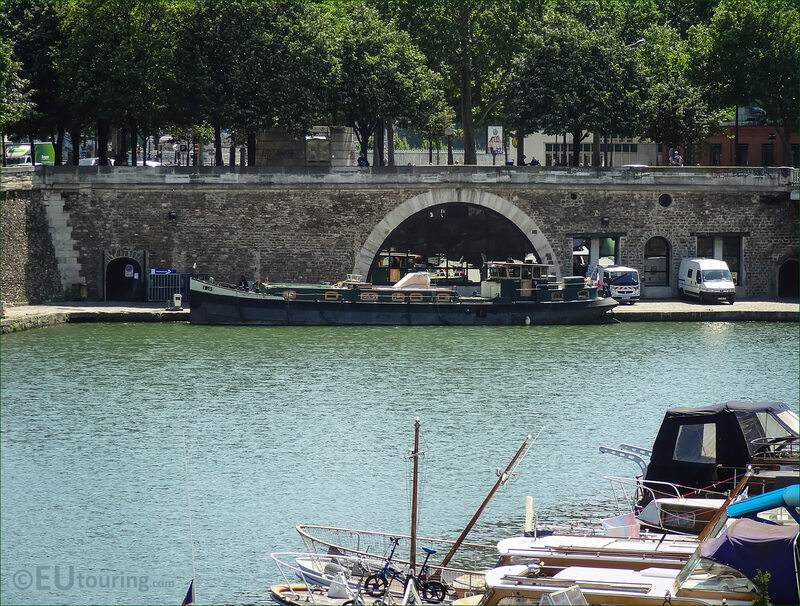 Pleasure craft, house boats and rental boats have occupied the Port de l'Arsenal since it was completely revamped in 1983, and this is a photo we took showing some of these moored up close to the Pont Morland bridge and its floodgate, which was constructed in the 1800s and is still in use today as the entrance to the Arsenal marina from the River Seine. 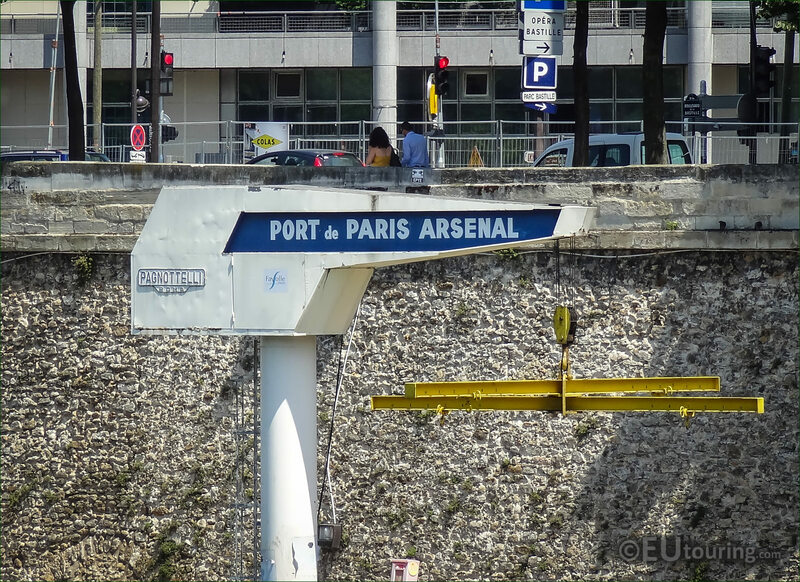 This is a photo we took showing a part of the Port de l'Arsenal leisure port along with a part of the metro railway with the Opera Bastille building in the background, and incredibly, as you go under this bridge in Paris, it take you under the Place de la Bastille in a tunnel over a kilometre long before it emerges further up the canal. 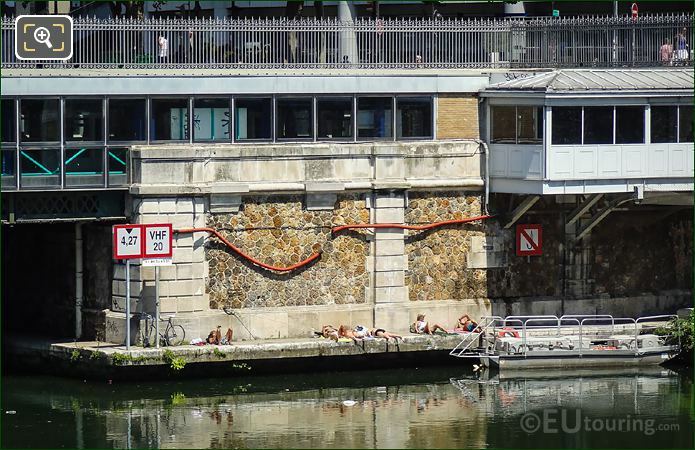 Some people really do find unusual places to relax in the sun, and we took this is photo at the Port de l'Arsenal looking towards a stone part that the metro station rests on right next to the entrance to the underground tunnel of Canal Saint-Martin where several people were sunbathing in peace and tranquillity.